POCUS Evidence Atlas - Pulmonary. 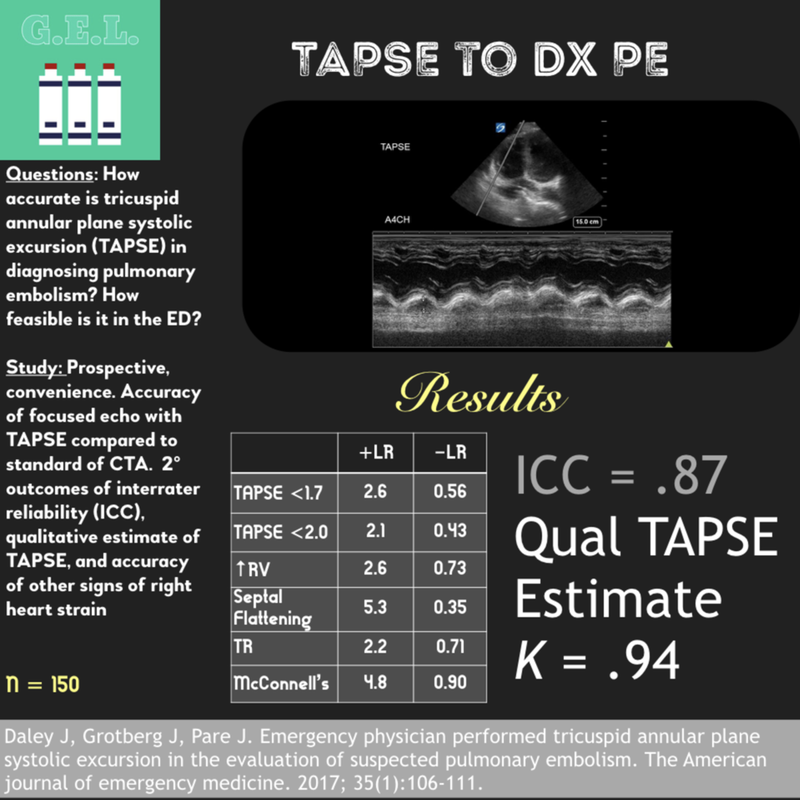 EBM review and resource of POCUS for pulmonary diagnoses. Sensitivity Specificity positive and negative likelihood ratios. This was a systematic review of 8 prospective studies (n=1048) of adult patients. Included manuscripts evaluated for traumatic or iatrogenic pneumothorax. No studies that screened for spontaneous pneumothorax were included. Examiners were surgeons, radiologists, or emergency providers. Reference standard was pneumothorax found on CT or a rush of air upon tube thoracostomy. All studies but one used the ultrasonographic signs of lung sliding and comet tail to rule out pneumothorax. Although the exact technique used to perform the ultrasound examination is not reported with enough detail in some studies, most agree on requiring the examination of more than one intercostal space in both the midclavicular line and laterally and inferiorly at the anterior or midaxillary lines. Lastly, this data does not evaluate whether the pneumothoraces identified were clinically significant. This was a meta-analysis including 12 retrospective and prospective studies (n=1554) of adults and pediatric patients. Ultrasound was used to diagnose pleural effusion, with the reference standard either CT, surgery, or a more formal “high quality ultrasound in conjunction with expert end diagnosis.” Ultrasound examinations were performed by a variety of operators including emergency physicians, intensivists, radiologists, and nurses. Exact criteria for diagnosis of a pleural effusion by ultrasound was not defined. The was a systematic review including 20 prospective adult and pediatric studies (n=2513) with varied settings including the emergency department, inpatient wards, or ICU. A positive finding on ultrasound was identified as an alveolar and interstitial pattern or consolidation, although this is not further expanded upon. Gold standard was either CT, chest radiography, or “clinical diagnosis” depending on the study. One large caveat of this study is that it has a very large degree of heterogeneity, with ultrasound examinations performed by emergency physicians, intensivists, and radiologists of varying levels of expertise, on patients ranging from ambulatory to critically ill. This was a systematic review including 17 prospective studies (n=5108) evaluating the operating characteristics of lung ultrasound for pneumonia in adult patients seen in the emergency department with a clinical suspicion for this diagnosis. Reference standard was either chest radiograph, chest CT, or final clinical diagnosis. Included studies varied with regards to which and how many lung fields were evaluated. The operators performing ultrasound examinations were exclusively emergency physicians or radiologists. *Subpleural consolidation and/or focal B-lines were the diagnostic criteria in the majority of manuscripts included, however in 4 studies, no clear positive findings were specified.